SubliJet IQ Sublimation Inks for Epson entry-level sublimation printers. Ideal for beginners and mid level decorating shops that only need CMYK and up to 8.5"x14" transfer printing. Ships with Award Winning PowerDriver PRO® color management software FREE! 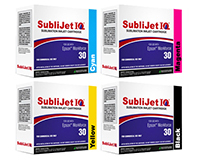 This color management software takes the quess work out of the process and greatly reduces your learning curve. Sawgrass Technologies now offers PartnerPlus - a comprehensive plan to fully guarantee SubliJet digital transfer inks against performance issues or defects, and to fully support any printer under Epson warranty when used with SubliJet inks. This comes after Sawgrass earned the title Certified Epson Service Center by completing Epson's Service Training Program. 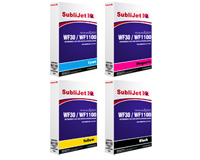 Sawgrass is the only sublimation provider that can provide a legitimate, full-Epson-authorized service program.